Create animated IT Applications and Process diagrams by signing up for a Trial Account. The Dragon1 Step-by-Step Guide is waiting for you in your Digital Workplace. This is an example Process Application Landscape Diagram created on the Dragon1 platform. On which you as Business Professional can learn, create, share and control interactive content. What is a Process Application Landscape Diagram? A Process Application Landscape is a standard architecture product best created in the form of an A0-sized architecture poster for the CIO and IT manager to have an overview for themselves and for the business of what is connected to what, where issues are, and what the impact of these issues is. This kind of an application and/or process diagram for reporting issues in the form of an A0-sized architecture poster makes it easy to communicate solutions and manage expectations, and prevent the business from creating sub-optimization and increasing complexity by introducing non-standard solutions. How was this Process Application Landscape Diagram created? This Process Application Landscape Diagram was created with a step to step tutorial: How to create a Process Landscape diagram. Speed up Results You can have your version of the Process Application Landscape Diagram after weeks by only updating the example. Dynamic Visualizations If you change data, the visualization template is automatically updated. Repository Collaboration You can be productive as a team working together on a Process diagram or an Application diagram. 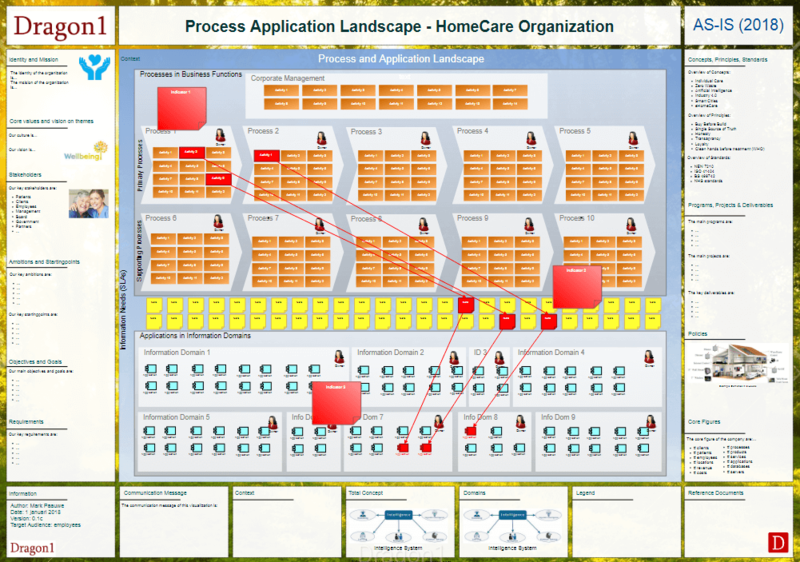 If you like the static Process Application Landscape Diagram, you may also like to watch this interactive example of a Process Application Landscape Diagram. You can, for example, build your own view by clicking away layers or filtering out certain information. This may give you ideas of how your own landscape diagram should look like and what you would like to use it for. If you do not have the time and you need a Process Application Landscape on short notice, we can create a Process Landscape for you.